Walmart, Target, and Kohl’s have seen an increase in foot traffic recently. Underwear can be thanked for that. Michael Jordan has been a key spokesman for Hanes for 30 years. To celebrate, Hanes teamed-up with Upper Deck who created a special set of cards. These exclusive cards can only be found in specially marked Hanes products. Upper Deck went with the 1988-89 Fleer Basketball design. (10) Michael Jordan autographs have been thrown in. They fall 1:108,625 packs. A complete base set consists of (50) cards with Red and Blue Foil parallels. All-Star inserts which have Gold Foil parallels are also possible to pull. 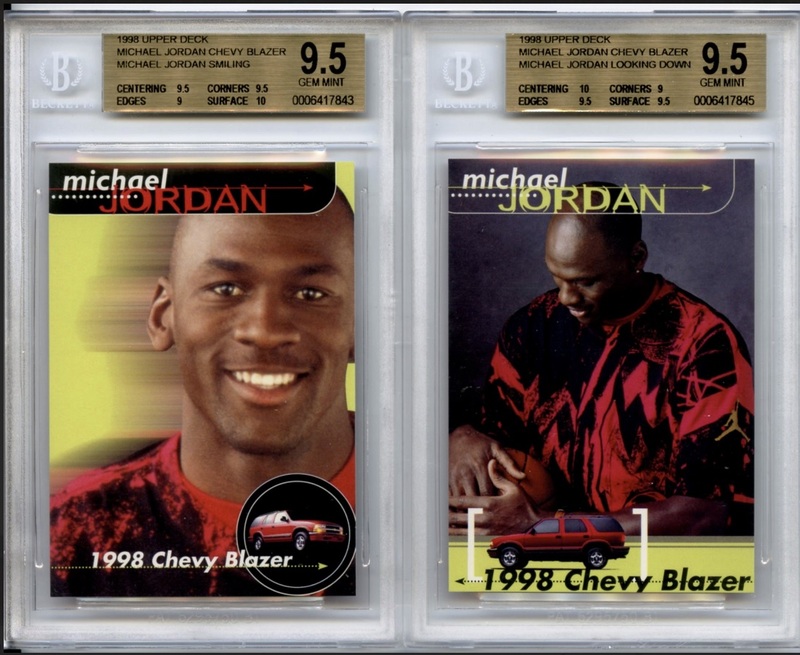 Over the years we’ve seen some incredible sales of Michael Jordan cards. His 1986-87 Fleer rookie is a hobby icon. Recently a 1997 Metal Universe Precious Metal Gems Green #’ed/10 parallel of his sold for $350,100. Collectors go crazy for his stuff. I can’t wait to see what one of those Hanes autographs sells for. My guess is $500-$1,000. In 1998, one of the more interesting Michael Jordan cards was created. A Chevy dealership in Chicago worked with Upper Deck and produced a small 2-card set. How were you suppose to obtain one of these cards? That’s simple. All you needed to do was purchase a new 1998 Chevy Blazer for $26,000. Along with the keys to your new purchase, you’ed be handed one of the two cards. It doesn’t end there folks. Those cards came with a nice little perk. You could exchange them for a dinner in a glassed-in room at Michael Jordan’s Restaurant. Either not many people purchased Chevy Blazers from that dealership, or they did and decided to cash-in on the dinner offer. Very few of these cards exist today. Restaurant staff most likely threw them away. Condition can be a big issue. They were handled a lot. Gem mint examples can sell for $600 per card. Reprints also are a problem. Based on the reprints I’ve seen, ones of Michael Jordan in the “looking down” pose have a black border around the edge on both the front and back. Reprints of the “smiling” pose seem to just have this border on the reverse. Michael Jordan’s Restaurant is still open. According to the cards, you’re suppose to call 312-644-DUNK (3865) ext. 227 to make reservations. I called the number, but its been disconnected. Their new number is (630) 828-2932. 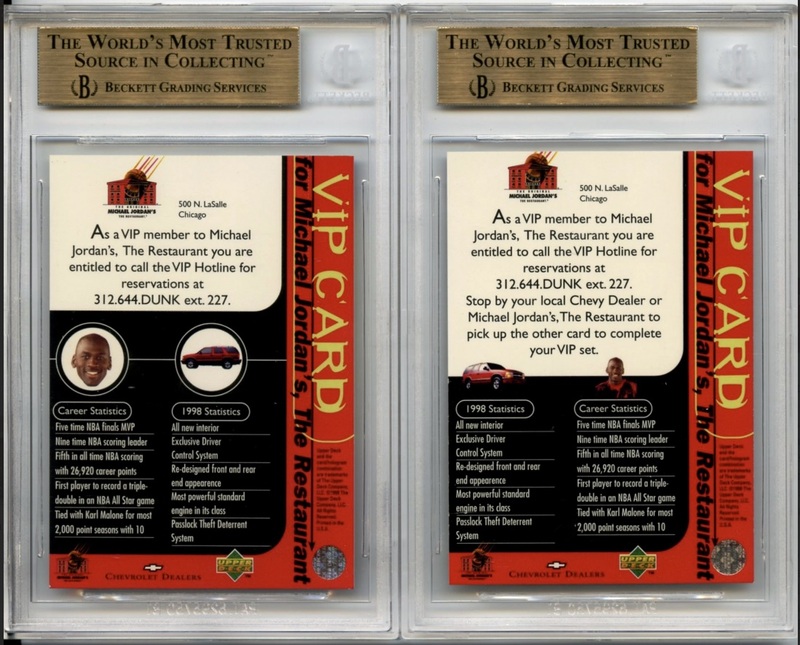 I’d love to see someone pull up to his restaurant today in their 1998 Chevy Blazer, whip out one of these cards, and ask for their meal.